Source of title proper: Title based on Vancouver Charter terminology. The basis for the authority of the City of Vancouver's City Council is the first Vancouver Act of Incorporation of April 6, 1886 enacted by the Government of the Province of British Columbia. The Act set out the powers, functions, and some procedures relating to the government of the City of Vancouver, and required election of a City Council, the governing body of the local government. Although the City of Vancouver funds the Library, the schools, and the parks, each of these have their own governing boards. The Act of Incorporation (more recently called the Vancouver Charter) has been amended frequently, and is periodically revised and consolidated. The Act has defined the increasing land parameters of Vancouver. In 1886 Vancouver extended from the West End and Alma Road in the west, to Nanaimo Street in the east, and 16th Avenue to the south. 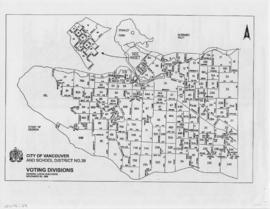 In 1911, District Lot 301 and the Townsite of Hastings were annexed (so that Vancouver then extended east to Boundary Road, and south to 25th and 29th Avenues in some areas of the eastern half of the city). 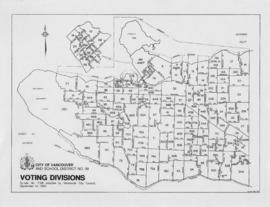 Then in 1929, the municipalities of South Vancouver and Point Grey were amalgamated with Vancouver (to result in present-day boundaries to the south and west). City Council's powers may be exercised by by-law or resolution, according to the provisions of the Charter. Powers have included: creation and maintenance of "public works" (now often referred to as "the infrastructure"); land and building regulation; provision of police and fire protection; maintaining health standards; provision of cultural and recreation services; and tax collection through property taxes, business licenses, and other fees. Local government is responsible to the provincial government, according to the Municipal Act of British Columbia. Some of the relationships with provincial and federal government are intricate, as program requirements are legislated from above, and some program funding is provided by senior governments. The Mayor is the president of Council according to British parliamentary traditions. In order to carry out its functions Council has the authority to determine the internal organization of the governance and bureaucracy. Until 1956 Council was formally involved in all aspects of the operations of the City through the "Council Committee" system. The system was seen as increasingly cumbersome and ineffective, so the Board of Administration was created to take care of managing operations, all the bureaucracy's administrative and service functions except governance (as of 1974 the Board was replaced by the City Manager). Standing committees, as subdivisions of the major aspects of the business of Council, have always existed. The responsibilities of the City Clerk were established with the Act of Incorporation in 1886, which declared the City Clerk to be the Returning Officer of the City (the official responsible for voters' lists and elections). Additional duties included purchasing supplies and were somewhat undefined. With the clarifications of the 1900 Act of Incorporation, formalized responsibilities included recording Council minutes, keeping custody of the by-laws, and maintaining financial records. The Clerk also received all mail directed to the City. A 1912 by-law assigned responsibility for facilitating communication between the citizens, the Mayor, Council, and Council's committees to the City Clerk. In a 1953 Act of Incorporation amendment, the Clerk was named as custodian of the City seal. With the exception of financial functions, which long ago passed to financial officers, the Clerk's responsibilities have remained remarkably consistent. The primary functions over time have been: taking minutes for the meetings of City Council and related bodies; keeping the records of the City of Vancouver as required by the Vancouver Charter; carrying out correspondence on behalf of Council; keeping all records related to City Council decision making (including large volumes of supporting documents); assembling voters' lists and carrying out elections (for Council, the Park Board, the School Board, and on plebiscites); providing communication, information, and public relations services, including responsibility for civic ceremonies; and, since 1970, responsibility for the Archives. From 1886 to 1974, the City Clerk reported directly to Council; from 1974 the position has been reporting to the City Manager's Office. Although the formal organization of the City Clerk's Department has in recent years consisted of a number of divisions - the Council secretariat, the Voters' List Division, periodically a small Public Relations / Communications Division, and the Archives and Records Division (since 1970) - in practice, the Office of the City Clerk has included all divisional sections except the Archives. During some periods the Office of the City Clerk was more commonly referred to as the City Clerk's Office, though the former has prevailed. For more historical information on the above bodies see the inventory for the City Council and the Office of the City Clerk fonds. Administrative histories for other creators in this fonds (e.g. Airport Board) are given at the series level. For South Vancouver and Point Grey municipality Council, City Clerk's, and all other retained archival records dating from before amalgamation with the City of Vancouver in 1929, see the Corporation of the District of South Vancouver fonds and the Corporation of Point Grey fonds. The offices forming City Council, the mayor and aldermen (now called councillors), are arranged as the Mayor's Office fonds and the Councillors' office fonds. Series consists of handwritten, typed, and otherwise reproduced, signed originals of poll by poll and final tallies for general elections and a variety of by-law and other plebiscites. General elections were held for mayors (from 1886), aldermen or councillors (from 1886), Park Board commissioners (from 1888), licence commissioners (from 1892), and school trustees (from 1893). Arranged chronologically. Transferred previous to 1992, in 1992, and in 2000. 1999 originals at Office of the City Clerk. Container list only available for 1886-1961. As of 1962 each election is a filing unit with the scope and contents field listing declared results including those of plebiscites, questions, etc. (as well as names of successful candidates, but no figures). Attached to the file list is a "List of Money By-laws and Plebiscites in Volume 1", i.e., for 1887-1910.